I love gorgonzola! It’s fantastic! In general, I love to eat (and cook) the food with the cheese. innovatel, I like Gorgonzola a lot too. Unfortunately, my wife doesn’t like it. I’ll try and read what you wrote about it. I speak a little bit of Italian so it will be slow going for me. In my house only me and my mother love it. My father and m brother hate it. So it’s difficult to do a food with it … sometime I did not have time to cook two food. Did you ever try gorgonzola over a “hot-bread”? uhh … fantastic. What is a hot-bread? Toast? Bruschetta? I think something might have been lost in translation there. I love Gorgonzola cream sauces they are a perfect blend of salty, tangy, and creamy. Yum! innovatel – Your English is better than my Italian. “forno” is oven in English. “piastra elletrica” is probably electric griddle in English. Is the bread just toasted? Is something else put on it? How is it cooked? Just saw your photo on foodgawker. This looks delicious. My boyfriend and I both love gorgonzola. A favorite dish of ours (with some local Austin flavor) is linguine with gorgonzola, jalapeno, and grilled chicken. Next time I’ll try the butter, milk, cream approach instead of starting with a bechamel. How fabulous is this? I can only imagine! 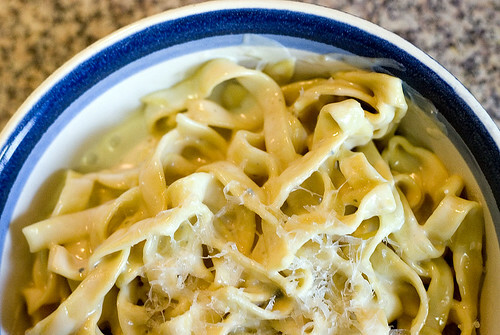 Fresh pasta and gorgonzola cheese? I think I’ve died and went to heaven. After some minutes add gorgonzola into the bread and insert for some seconds the bread and gorgonzola into electric griddle. lisa – Your dish sounds interesting but I usually avoid grilled chicken because of its blandness but the japaleno does sound good. I think that cream seems lighter than using a bechamel with pasta. It’s probably something to do with the flour in the bechamel. innovatel – I think I’ve figured out what you’re talking about. Do you eat it as a sandwich (two slices of bread) or like toast (one slice of bread)? If it’s a sandwich, there’s an American creation called grilled cheese which would be similar (but usually has bad American cheese in it). The electric griddle you’re describing may actually be a toaster. Does it stand upright and do you insert the bread into it vertically? Maybe find a picture of it. Gorgonzola sauce on pasta is so good! This looks amazing! I was proud of myself that I was able to translate this one without the English 🙂 Haha. I just had Gorgonzola pizza today so I’m on a pro-Gorgonzola kick.